An honest police inspector (Navin Nischal) is killed by Raiszada Narsingh (Amrish Puri) and his henchman, Dhansukh (Paresh Rawal). Raiszada frames Rajeshwarnath (Anupam Kher) for this killing, and brings up the son of the police inspector, Ajit (Sunny Deol), so that Ajit can avenge his father's death by killing Rajeshwarnath. Raiszada wants the now grown-up Ajit to fall for beautiful Nisha (roshini), but Ajit gives his heart to Anjali )Poonam Dhillon), who is the sister-in-law of none other than Rajeshwarnath. With Rajeshwar all set to clear his sentence, he will have to face the contained wrath of Ajit, and of the plan Raiszada and his men have for him. 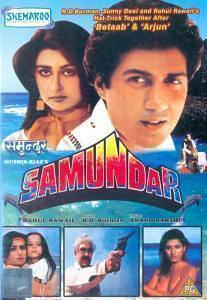 Buy Samundar (1986) bollywood dvd with english subtitles, sold & shipped by JSM MUSIC where you can shop online for Hindi Movie DVDs & Bollywood Music Audio CD & MP3, Discounted Indian DVD. This Hindi Movies collection has been tagged as romantic cinema, action film, hindi movie dvd.